After picking a musical act to listen to, I usually do a little bit of research in order to decide which of their albums are the most popular, or which ones received the most critical acclaim. I usually aim to listen to the albums that most people associate with the group, rather than accidentally choosing the embarrassing concept album or the reunion CD made for a quick buck. I didn't have a chance to delve into the history of the Byrds that much at the beginning of the week, but a quick survey of some critics' lists revealed that their 1968 album Sweetheart of the Rodeo seemed to receive the highest amount of acclaim. I decided that this would be the album that I listened to every day of the week. This wouldn't be an issue, except Sweetheart of the Rodeo sounds like almost nothing else they've ever done. When the Byrds crossed my mind, I usually thought of drugged-up psychedelic covers of Dylan-esque folk songs. But Sweetheart is something else entirely - a Hank Williams-style country album, filled with twangy guitars and southern drawls and songs about Christianity and lost love. Did I like it? Of course. It was good country, and seemed like especially American listening considering the holiday last weekend. But I couldn't help but think that Sweetheart is an outlier, and not necessarily representative of the "classic" Byrds that everybody talks about. I did more research throughout the week, learning about the group's changing roster, of Gram Parsons' influence on Sweetheart, and why the band evolved stylistically. I suppose it's a mistake to assume all musical groups have one specific "style" that sums up their work. To call Sweetheart "un-Byrd-like" is a contradiction in terms, and I give credit to the group who went full country after a previous album filled with Moog synthesizers and songs about dolphins and Arthur C. Clarke stories. I'd be lying if I said the disparity wasn't a little jarring. But that's my fault - not the Byrds. MY LISTENING: I listened to Sweetheart of the Rodeo (1968) every day this week. I also put on The Notorious Byrd Brothers (1968) four times, and Younger Than Yesterday (1967) and Mr. Tambourine Man (1965) three times each. WHAT I KNEW BEFORE: Basically, only a few of the Byrds' biggest hits - the psychedelic ones like "Mr. Tambourine Man" and "Eight Miles High" (namechecked in "American Pie"). Also, I have a vague memory of listening to "Turn! Turn! Turn!" at some sort of summer church camp where we compared the Byrds' version to the Book of Ecclesiastes. As I hinted at above, the Byrds have the ability to craft a diverse set of songs, from their famous druggy hazy stuff to country and rockabilly to plain old folk. The diversity partially comes from their ever-changing lineup, and the fact that all the members of the band seemed to hate each other. Still, it's impressive that they can carry off the straight folk of Mr. Tambourine Man just as well as the sincere country of Sweetheart of the Rodeo. A lot of their earlier, folk-influenced stuff is just very laid back, and it's relaxing to let the well-constructed melodic harmonies wash over you. Roger McGuinn's twelve-string guitar is instantly recognizable on almost any song it's in, and if the riffs can be a little repetitive, its jingle-jangley sound is very pretty and suits the music well. Songs like "The Bells of Rhymney" are a pretty good example of the best of the Byrds' early stuff, and "My Back Pages" shows a bit more maturity. I prefer their more straight folksy stuff to their more psychedelic side - but even songs like "Goin' Back" won me over as melodic, well-constructed hazy drug tunes. And "Artificial Energy" is raucous, over-the-top psychedelia, filled with roaring horns and bombastic instrumentation. But the Byrds also know how to rock, especially on their earlier albums. "All I Really Want to Do" reminds me of the early Beatles - short, simple pop with a good energetic beat to it. "It's No Use" is even better, a catchy blues-rock endeavor. There are strains of country in their earlier work - songs like "Time Between," and "Wasn't Born to Follow." But Sweetheart of the Rodeo, though it eschews their other styles, is a masterpiece without a weak track. 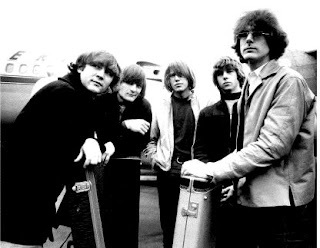 The Byrds flawlessly jump from the classic Hank Williams style ("You Ain't Goin' Nowhere") to Appalachian fiddle tunes ("I Am A Pilgrim") to tragic Western ballads ("You Don't Miss Your Water") to Johnny Cash-esque outlaw music ("Life in Prison") to a good old foot-stompin' ditty about criminals ("Pretty Boy Floyd"). Even the tongue-in-cheek songs work - in "The Christian Life," the narrator sings about how all his friends hate him now that he's found religion - work as catchy traditional tunes. But, with that one exception, Sweetheart of the Rodeo is played straight, and that's what makes it so effective. You can tell that Gram Parsons and the rest have a real respect for country music and it's influence on rock and roll, and that's what makes the music so great. Other "country rock" outfits are usually more rock than country, but the Byrds embrace the genres of this kind of American music. There are some aspects of the Byrds that should not be approached without the initial consumption of hallucinogenic drugs. A handful of their songs are just too artistically pretentious - take "CTA-102," which starts off like the normal Byrds, and degenerates into drones and Muppet-voiced mumbles. Others, like "Mind Gardens," avoid the weird sound effects, but instead accentuate the drugged-out psychedelic lyrics to their natural breaking point. While many of the Byrds songs are laid-back, relaxing, and have this floaty ethereal aura to them, you can have too much of anything. "Draft Morning" sounds like it's being sung by a ghost, and the vocal effects are more of an annoying than anything else. And "Dolphin's Smile" is not a horrible song...that is, until cetacean sound effects come in. At least the Byrds show some sort of self-awareness toward their own psychedelic pretensions. Roger McGuinn describes the spiritual ballad "Change is Now" as "another one of those guru-spiritual-mystic songs that no one understood." Finally, despite the fact that it might be their biggest hit, I'm just not very partial to the Byrds' cover of "Mr. Tambourine Man." The vocals are too annoying, the song too trippy to be enjoyable. I wasn't crazy about Dylan's version either, but it's certainly better than this piece of pop psychedelia which, in 2010, works more as historical artifact than a timeless piece of music. But hey, it's better than William Shatner's version. FURTHER EXPLORATION WOULD ENTAIL: I left out a few notable Byrds albums, including Turn! Turn! Turn! (1965), The Fifth Dimension (1966), and the half-live untitled double album from 1970. Beyond that, there's a lot of Gram Parsons that I'll have to explore. BEST SONG YOU'VE HEARD: "Eight Miles High"
It's drug music, yes, but catchy drug music with a good bass riff. BEST SONG YOU HAVEN'T HEARD: "You Ain't Goin' Nowhere"
Now this is how you do a cover of a Dylan song. NEXT WEEK'S ARTIST: Kanye West.